Saying "yes" to God may take you places you couldn't imagine. For Kingwood University student Lindsay Miller, the journey of obedience has led her to the streets of New York City, the villages of Haiti and, most recently, the refugee camps of Europe. In 2012, Lindsay enrolled in Kingswood University's Praxis Program, working toward an A. A. in Evangelism and Compassion ministries. Through Praxis, she ministered to homeless in New York City, led Bible studies for recovering addicts, served in soup kitchens, and traveled to Haiti for building projects. 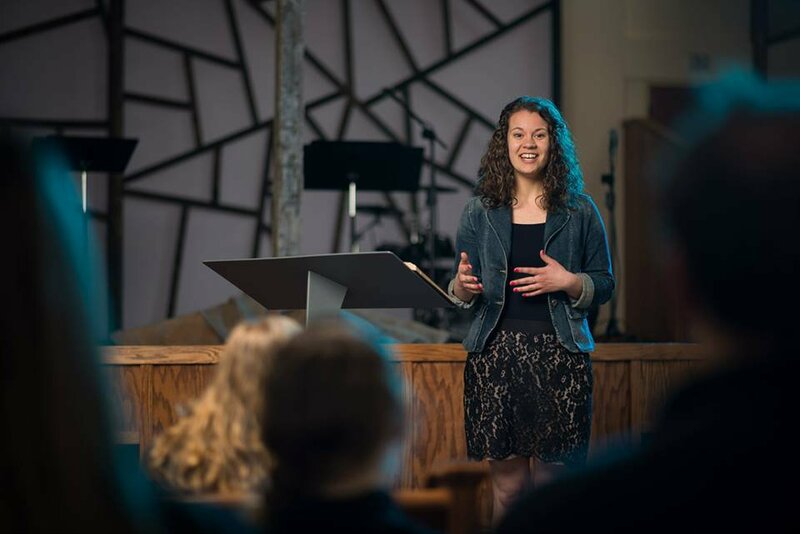 Eager to disciple others in ministry, Lindsay also became an Ecclesia team leader, serving with summer teams of high school students in locations in the U. S., Canada and abroad. Lindsay is now a fourth-year student, soon to be graduating with a B. A. in Global Ministry. Her final semester of KU studies took the form of a fourth-month-long internship in Macedonia, where she taught English and ministered to refugees. Macedonia is at the heart of Europe's current refugee crisis, hosting millions of refugees in dire need of food, shelter, and the hope and light of Jesus Christ. Lindsay's ministry group spent time in the tent camps, serving fruit and hard-boiled eggs, and connecting one-on-one with the travel-weary refugees. "There is something so special about watching the joy that radiates from some of the refugees, children and adults," wrote Lindsay in one blog entry. "Though I am not facing times like those I am serving, it helps me keep perspective in my daily life and to be joyful, as I have so much to be thankful and joyful for, all because of what Jesus has done for me." Through KU's global ministry programs, Lindsay has been transformed and equipped to incarnationally share the good news of Christ all over the globe. "Kingswood has played an immense role in my life and walk with the Lord," shares Lindsay. "Many of the lessons learned and taught in and outside of the classroom have been incredibly beneficial in my current ministry." After graduation, Lindsay is eager to see where God will lead next. "As I serve in many different roles, I am continually reminded of God's global mission to reach all people. It has been encouraging to see the global church at work." To read more about Lindsay's ministry in Macedonia, check out her blog. Lindsay Miller teaching at Kingswood. The best thing sabbatical did for me was to give me a renewed sense of God's love."